Rafael Nadal raced into the quarterfinals with a 6/3; 6/2, 7/6 victory over of German Maximillian Marterer. 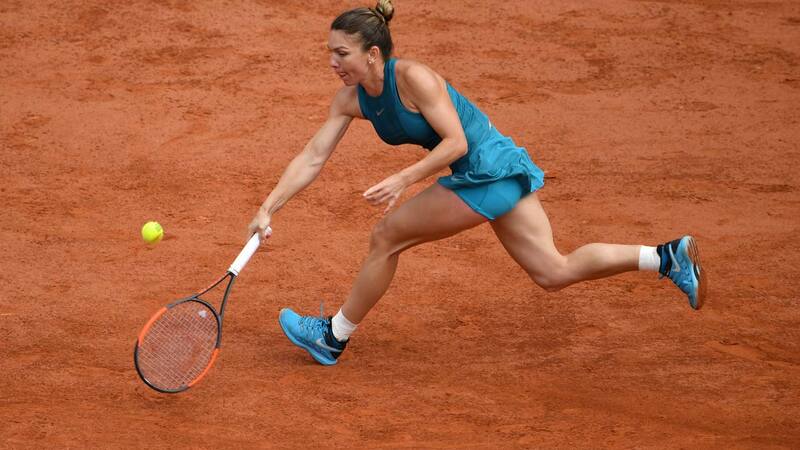 Top-seeded woman, Simona Halep swept past Belgian Elise Mertens 6/2; 6/1. Angelique Kerber defeated Caroline Garcia of France 6/2; 6/3, but second-seeded Caroline Wozniacki suffered an upset in the hands of Daria Kasatkina of Russia7/6 (5); 6/3 and Kevin Anderson lost a heart-breaker to Argentina’s Diego Schwartzman 1/6; 2/6; 7/5; 7/6(7); 6/2. After Nadal led by two sets to love, Marterer found his footing and put up a fight in the third set. He held serve in the opening game and secured the first break of Nadal’s serve to lead 3-1. 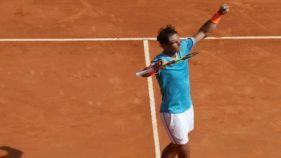 Nadal broke back at love and held after a long rally at 40-30 to level 3 games apiece. Marterer was taken to deuce but held serve for the seventh the seventh game. The games went with the server, leading to a tie-break. Marterer shot in front 1-0 and took one of Nadal’s twos service points lead 2-1. However, the 22-year old German southpaw, ranked 70 in the world, dropped two points on serve for Nadal to lead 4-2 at changeover. Although Nadal lost one of his service points, he took one of his opponent’s and sealed the victory by 7 points to 4. The drama lasted 2 hours and 30 minutes. When Elise Mertens won the opening game on her serve, it portended a stiff contest, but she lost her serve to concede the third game while Halep extended the gap to 3-1. Mertens was stretched to deuce before holding the fifth game but Hale was unrelenting and won hers serve for a 4-2 lead. In the seventh game, Mertens was up 40-30 and but after deuce, her opponent took the game. Halep served out the set with loss of but one point. Serving first in the second set, Mertens lost three consecutive serves and Halep held to lead 5-0. Serving for the match, Halep lost three straight points and was broken for Belgian to register on score board. When she followed the break by taking the first point on her serve, hopes were raised but she lost two points to face match point. After 59 minutes, Halep was through to the quarterfinals. In a match that was brought over from the previous day, Russia’s Daria Kasatkina, the 14th seed, defeated the Australian Open Champion Caroline Wozniacki by winning the first set in a close tie breaker, 7 points to 5 and with a single service break to take the second set by 6 games to 3. The sixth seeded Kevin Anderson took off on a roll, as he took the first two sets 6/1; 6/2 against Diego Schwartzman. The eleventh seeded Argentinean held serve to open the third set which flowed quickly with the powerful serving by both players. A single break of Anderson’s serve sealed the set to level the match. Anderson had the opportunity to secure the essential break of serve in the fourth game of the fifth set but Diego cancelled it to hold his serve. The fifth game will remain to haunt Anderson for a long time. He was cruising well on serve and had 40-30 but was taken to deuce. On the frist advantage, Diego won a long rally to deuce. Another long rally annulled the game point while the third advantage went to Diego and the game was his. He held serve to lead 4-2 and broke Anderson’s serve for an unassailable 5-2 lead. The Argentinean did not drop a point in taking the eighth game for 6-2 and victory after 3 hours and 51 minutes.